Our tarpon season lasts from the end of February all the way through July with smaller tarpon hanging around through November. 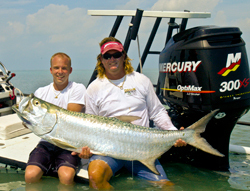 Our peak migration for tarpon that has made Key West so famous happens durring the months of May, June and July. Tarpon can be caught using live bait, artificial baits, dead bait, chummed bait and fly fishing makeing it possible for anyone at any age to catch one using the skill they have as an angler. As a bonus tarpon mostly reside in the inshore backcountry areas offering calm crystal clear waters and no seasickness for concerned anglers. Always a nice day and not far from shore when you go tarpon fishing with us here in Key West. Flats fishing for tarpon using a flats boat in the shallows sight casting to these massive fish is a great way to enjoy your day using both fly fishing and spin fishing gear to catch the Silver King Tarpon. Bay boats are the latest rage here in Key West offering better stability and more versatility. With the use of Trolling motors a bay boat captain can keep you in the schools of fish all day long. Starting in late February and going till the end of July we have tarpon all over Key West harbor. We take you fishing for tarpon with dead bait and chum. Harbor trips are the best way to go out and catch a tarpon with little or no experience. Everyone can do it. 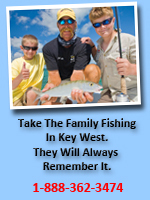 We specialize in Tarpon fishing here in Key West. 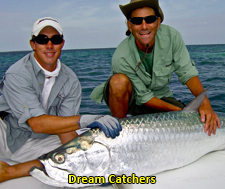 With more trips daily chasing tarpon all over the lower keys than any other fishing guide and a network of fishing guides constantly working with each other to keep you in the bite you cannot go wrong. Fun times, lots of fish and great equipment. 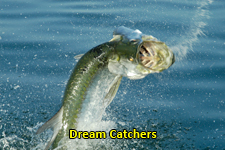 Learn more about The Key West Fishing Team of Dream Catcher Charters. We have taken Guided fishing charters to the next level. 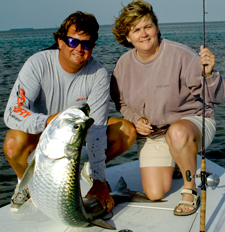 Tarpon fishing charters are 4, 6 and 8 hours in length. We offer morning, evening and night trips for you to chose from for 1 - 6 persons. Bring a hat, sunscreen and glasses to your tarpon adventure. also, whatever you would like to eat or drink. We supply everything else. We supply Bottled waters, bad jokes, fishing gear (Fly and Spin), licenses and tackle (including fly's and leaders).